Also known as over pressure protectors are used to protect the pressure gauge from over pressure. The gauge saver has a predefined setpoint at which it will not allow any media to flow. The setpoint can be varied for a max span of 10% of set pressure. 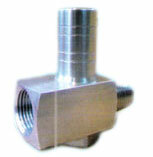 Available for set pressure ranges from 1000mmwc (0.1 kg/cm2) upto 600kg/cm2.